I am still loving the variety of blocks I get to make for the 2 online quilting bees I'm in. 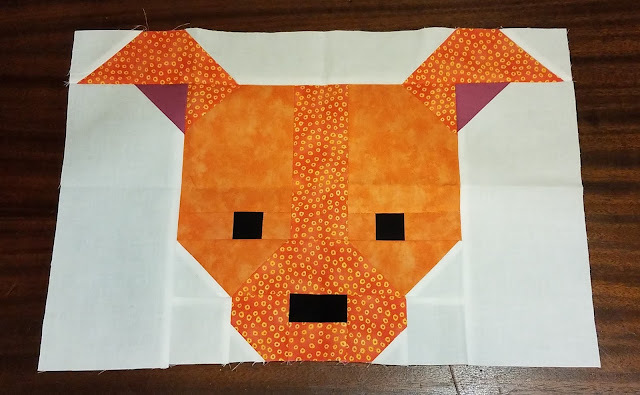 In Bee Inspired, Queen Ann asked for a Doggone Cute block. These are from a quilt along by Lorna from Sew Fresh Quilts and Lorna keeps the directions up on her site. I love Lorna's patterns and have been considering this one for a while. After making this block for Ann, I made an identical block for me that will be the start of my own Doggone Cute quilt. Ann asked each of us to think of a dog that has mattered to us and to pick out which of the eight Doggone Cute blocks most resembles that pup. I chose my dog, Ivy, and decided that dog #2 was her best match. Ann wanted bright colors so I picked orange because Ivy herself is kind of orange. Ivy has been with me since 4th of July weekend in 2010. She is my first pet. My parents were not pet people and no amount of begging during childhood from me & my brother changed that. Ivy was rescued from a busy highway by the sister of a coworker. Said coworker had been working on me to get a dog and she thought this one would be a good fit since she was so sweet. They both wanted to keep her, but they had 3 or 4 dogs each and could not add another. I had just been laid off from my job at the time and didn't think that adding the expense of a dog was a good idea. My boyfriend, who grew up with lots of animals and loves dogs in particular, assured me that "the dog food fairy" would show up and help. I'm glad to report that he's now Husband and he does indeed buy the dog food. In Stash Bee, Queen Mary Ann asked for Garden Stars blocks. She loves batiks and so do I! I had a lot of fun looking for bright batiks to use. Mary Ann suggested a technique I had not tried for the 4-patch blocks. I tried it but did not like it at all. Perhaps it's just me, but I didn't get enough units and had to cut more. Luckily, I only used that method on one block to try it out and I went back to more traditional methods for the remaining 4-patches. I like trying new techniques but I admit, I will give up if they do not work for me! Mary Ann is using the blocks from her turn as queen to make a quilt for Friendship House, an organization that provides transitional housing for young adults with intellectual and developmental disabilities. The idea is neat: each apartment has four people, one young adult transitioning to living alone and three students studying various healthcare fields. Mary Ann's goal is to put a colorful quilt on each of the 24 beds in the facility! When I saw that she hopes to make 24 quilts for this cause, I thought of my Midnight Mystery quilt. I finished the top and was never sure what I wanted to do with it. I made it without a plan for giving. I knew it could easily be enlarged to be bed-sized and bought extra background to do it, but never added any borders. I also had no idea how to quilt it and I really dislike quilting large quilts. After thinking on it for a few days, I emailed Mary Ann and asked if she would like the top toward her goal, emphasizing that it was an unfinished top. Mary Ann wrote back within a day and is thrilled at the donation. And I am quite sure the quilt is going where it was meant to be. I now realize that I never blogged this quilt because it didn't actually get finished. Here's a photo of the top. The background looks like navy in the picture but it's actually a dark purple. Kona purple, to be exact. I haven't mailed blocks off to either queen yet but I will get them packaged up and shipped off in the next few days. I can't believe how close we are to September! Very fun bee blocks. I love your doggy block and the story that goes with it. Our poor Drama Teen has begged for pets for years, but I'm highly allergic to animal dander so we couldn't keep an indoor pet and it's too hot/cold in Oklahoma to make a dog stay outside all the time. My Meadow Mystery quilt ended up being a donation as well. It went to an auction to support one of the doggy shelters in the area. Love the dog block in orange Emily! And I love your Meadow Mystery quilt - that's a gorgeous version! I love the batiks you used for the Garden Stars blocks, you made a great job of them they are lovely. 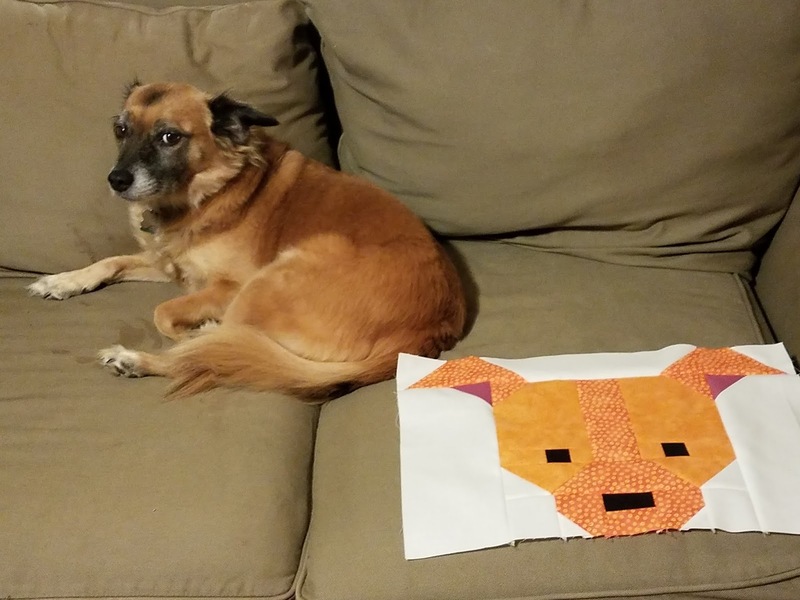 Ivy doesn't look too sure of her quilt portrait but I really like it and a good colour choice for Ivy too.